In response to a question on a greeting on FB featuring bajra bhakri on the occasion of Bhogi, I rack my brains as to why raw onion was served with the bhakri even on an “auspicious” day. Going into the “Aai mode”, thinking what she would say and what she would do, I hazard a couple of guesses - kanda-bhakar go well together... or it's part of the cornucopia of the season... or the fact that this is more of a social, harvest festival than religious. Then, the reader-pleaser that I am, I propose the ultimate resort – will ask my mother! Aai is my safest bet. I still like to hold a very childlike belief that she knows everything. If she doesn't, she'll honestly admit it, but that is not the end of the matter. She perseveres, makes a mental note to ask someone or reads up about it. But will she then stop? No, not until she has loud-thought and exhausted all possibilities - and her listeners. I didn't dare to interrupt her as a child, but over the years, have learnt to distract her into finishing. It goes without saying that my curiosity why kites are flown in India during Sankranti, met with a rational account of how the change in the temperatures caused by the slanting rays of the sun caused strong and dry winds suitable for kite flying to blow, and how this tradition originated in farmers flying kites to assess the weather in preparation of their next lot of crops. Oh yes, Makar Sankranti did lend itself very well to her generous exposition. There was an element of thanksgiving for the bounteous harvest in preparing offerings with the produce such as cluster beans, sugarcane, carrots, green garbanzo (hari boot) and jujubes (ber). The plenty and prosperity also brought about peace, and in their bonhomie people urged each other to be cordial at all times. In a brief sojourn from their tough routines, women folk socialised and celebrated their good fortune (literal meaning of the word ‘saubhagya’), gifting ‘haldi and kumkum’, bangles, little combs and trinkets, paan, supari, symbols of their privileged marital status. This was called 'vaan'. In their largesse, they would give out little clay pots called ‘sugadi’ containing fruit, vegetables and chunks of peeled sugarcane, sesame seeds and jaggery. 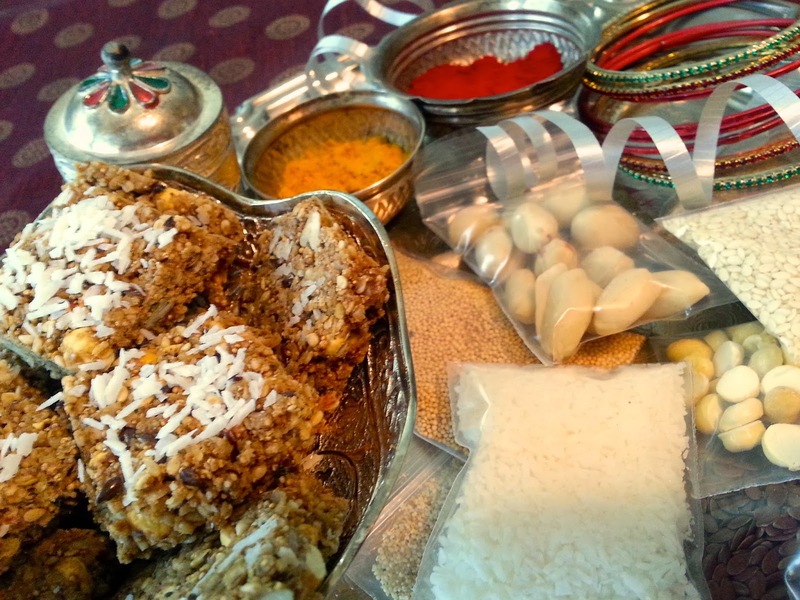 Care packages of khichadi grains, tea or sugar and cakes of soap were the more utilitarian options. With the womenfolk having such fun, can the kids be left behind? Not only did they tag along to all haldi-kunku functions collecting the ‘loot’, but they also had their own blasts. The ‘bor-nahan’, quite literally a jujube-shower for kids under the age of five, celebrated the mother’s indulgence in her child in this time of rest, relaxation and richness. 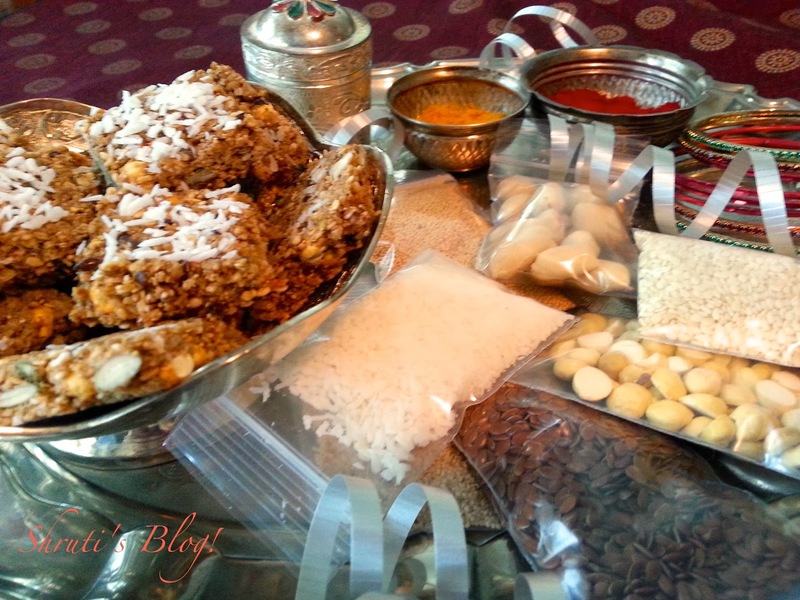 Whatever pangs a mum may have had about neglecting her kids during the hectic sowing season, were assuaged by dolling them up in trinkets made of sugar and til candy and showering them with a confetti of goodies like jujubes (ber), puffed rice, tilgul. Other kids at the bash playfully plundered the confetti amidst laughter and fun. And of course, Aai’s explanation as to why these foods, came uncanvassed. Since the festival is celebrated in winter, foods that lend energy and essential fats to keep the body warm and nourished are used. Freshly harvested til and gur happened to be some such foods. A torrid bajra roti with snowdrops of white butter, a heartwarming soft khichadi, a medley of spicy seasonal vegetables, and a very earthy and hearty gul poli glistening with oodles of ghee made for a well-deserved and well-earned meal to sate the hard-working farmer and his family. This year’s Sankranti was almost stolen by a Grinch. My firstborn, my partner in culinary crimes has been away and the lastborn is trying to be vegan and has always been least enthusiastic about sweets. The husband is on a diet, while my doctor has put me on notice to monitor my vital signs closely. 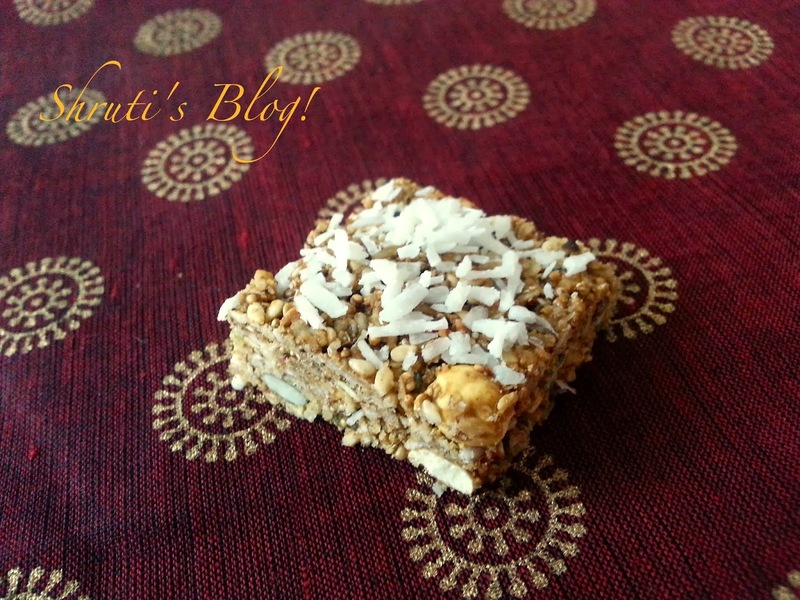 Sankranti treats, though healthy, are heat inducing and Melbourne is experiencing its worst heatwave in over a century…how and when and why should I make tilgul? The Sankranti cornucopia in my heart, the conch shell resonating my primordial rhythm across the seven seas, heeds neither topsy-turvy seasons, nor situational hurdles… a vegan and healthier ‘tilgul’, more in sync with my current cadence suggests - almost by itself. Layer a tray with baking parchment and sprinkle the reserved shredded coconut on it. Set aside. Soak the amaranth seeds for a few minutes, drain thoroughly and then pop them in a hot heavy bottomed pan, stirring continuously until most seeds have popped. Don't worry if all don’t pop. Remove on a plate. In the same pan, lightly roast sesame seeds and set aside. Next lightly roast the peanuts, flax seeds, poppy seeds and the shredded coconut one by one. Mix the seeds and nuts and reserve half a cup to be retained whole to add to the texture. Blitz the seed nut mixture for a quick few seconds, so you get a coarse meal. Heat the same pan and add the coconut sugar and about ¼ cup water. Mix thoroughly and let the mixture bubble and froth on low heat. Don't stir the mixture, unless it is burning. Test the syrup consistency on a plate. It should stand its own ground without running, but shouldn't be too stiff– you have to get it sticky enough to bind the mixture together. Mind your fingers, as the sugar syrup can be deceptively hot. Add the pulsed nut and seed mixture, the reserved whole mixture, nutmeg and black and green cardamom powder. Mix thoroughly into a sticky ball. Pop the sticky ball of the mixture on the baking parchment and pat it flat with a spatula. If you want to flatten it uniformly, place another sheet of parchment on top of this flattened mixture and pat it into a shape. Then carefully roll it into a uniformly thick mixture with a rolling pin and pat everything into place. Allow this to cool slightly and score the sheet into diamonds or squares or bars. Separate the shapes when completely cooled and store in an airtight container a cool and dry place. 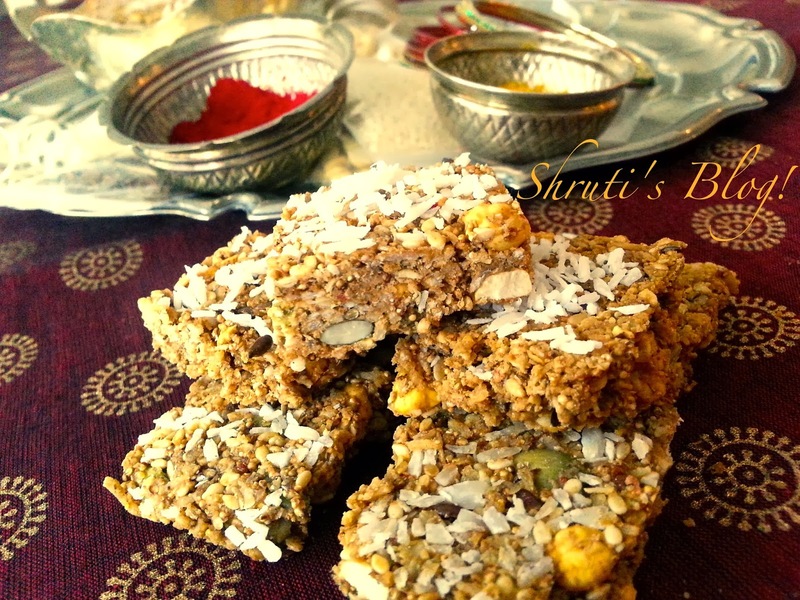 This healthy tilgul can be a munchy between meals, a breakfast supplement, something to crumble over your muesli, or that piece to pop when you want something sweet after a meal. This recipe looks amazing and I LOVE the name you've chosen for it.